Panasonic goes multi-room, wireless and waterproof | What Hi-Fi? Panasonic is introducing four new models to its family of All Connected wireless speakers. 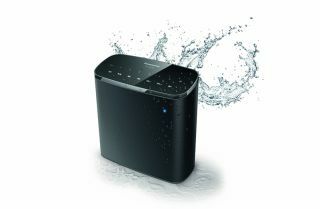 The SC-ALL05 (pictured above) could make quite a splash (pardon the pun), being a fully portable, waterproof speaker. The built-in battery should be good for around six hours’ playback and Panasonic claims you don't need to “worry about splash damage or even dropping the speaker in water”. Whether it can survive a full-on dunking remains to be seen. Next up is the SC-ALL7CD, a slimline all-in-one system which features USB, CD and DAB/FM functionality. Music streaming comes courtesy of Spotify, Napster and AllPlay Radio integration, all accessed through Panasonic’s Music Streaming app. CD ‘mixplay’ allows you to shuffle tracks from up to five of your favourite albums, which you can store in the system’s internal memory. Hi-res music is also on the menu with the ALL7CD supporting 24-bit/192kHz FLAC and WAV files. A pair of built-in speakers completes the all-in-one unit. The SC-ALL9 is an 80W, 2.1 system, whose woofers use a special Double Layer Bamboo Cone. The system features streaming options similar to the rest of the new range, although hi-res playback is limited to 24-bit/48kHz sample rates. If you plan to team two wireless speakers as a stereo set-up, the SC-ALL6 might just be the unit for you. You could even link them up with a soundbar from the All Connected range and use them as a wireless surround setup. As with the rest of the All Connected range, these new additions use Qualcomm's AllPlay platform, so you can team them up with other manufacturers’ speakers using the same chipset. Alternatively, you can use Panasonic’s Bluetooth Re-streaming feature, which allows you to share music between different Bluetooth speakers around your home.